Just when you thought it was safe to go back to the office, Big Pharma is at it again. I’ve never been a fan of direct-to-consumer advertising. I’d rather spend the few minutes I have with each patient in careful discussion of health promotion and disease prevention rather than discussing those “ask your doctor if Brand X is right for you” drug ads. My primary care patients learned over time that I’m a big fan of generics. If I recommend a drug, we’ll have a pro/con discussion of all the alternatives, not just the ones with great TV commercials. I tried to get more information on the app, but found that the top five sites that my search engine served up were actually outlets for maternity clothing. Kudos to the marketing team for their excellent research of the name. Additionally, I’m not sure how many adults really refer to their digestive system as their tummy. I did finally track it down and ultimately downloaded it to my iPad to check it out. I was disappointed. It wasn’t optimized for iPad, running in the tiny iPhone-shaped window instead. Data collection was minimal. I’d expect that if a pharmaceutical company was going to slap their name on it, they’d give it lots of bells and whistles. 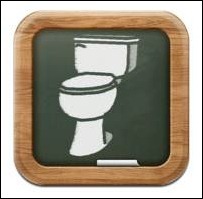 I decided to see what other apps were out there for the same patient group and found Bowel Mover Lite. It not only seemed to have more features, but even more important in my book, was pharma-free and the kicky logo was an added bonus. Really – don’t patronize patients with names like Tummy Trends (which is a little too close to the tummy time we recommend for infants anyway.) Bowel Mover displayed nicely on the iPad and also introduced me to Habits Pro and a couple of other apps. One was quite interesting – not appropriate for mentioning in mixed company, but check out Track & Share Apps, LLC and you might find it. I haven’t had too many patients bring in smart phone diaries other than calorie trackers and exercise apps. When you’re in the primary care trenches, however, every day is a new adventure. I’ll keep you posted if I see anything sassy, humorous, or awesome. If you see one that fits any of those categories, e-mail me.